64 inches (162.5 cm) across wingspan, 18 inches (45.75 cm) from cast on to bind off. This pattern is available exclusively through the Dragonfly Fibers Club until March 2016. It will be available for download to the public at that time. R22: k3, sm, yo, k1, (p1, k5, p1, k1) to marker, yo, sm, k3. Daelin is a soft crescent-shaped shawl, perfectly sized to be worn as either a scarf or a shoulder shawl. With squishy garter stitch up top, and a progression of lute- like lace on the edge, it features a sweet stitch cluster and a subtle picot edge. Yarn: 550 yards of sport weight yarn. 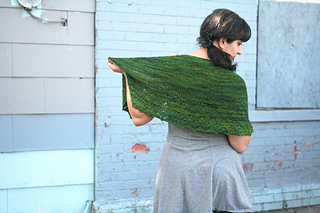 Shown in Dragonfly Fibers Damsel (335 yds/115 gm, 100% Merino Wool) in ‘Mossy Bank’. 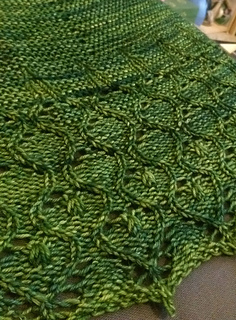 Gauge: 20 sts and 36 rows in 4 inches (10 cm) square in garter stitch after blocking. Finished size: 64 inches (162.5 cm) across wingspan, 18 inches (45.75 cm) from cast on to bind off. Needles: 32 inch (80 cm) circular needle, 4mm (US6) or size needed to obtain gauge. Notions: 4 markers (2 each in 2 colors for the center panel and for the edgings), safety pin style marker for marking RS of work. Stitches Used: knit, purl, yarnover, k2tog, ssk, sl1 k2tog psso, Centered Double Decrease, p3tog, dropped k1-yo-k1, (k1, yo, k1) into the same stitch, use of markers. This shawl begins with a Provisional Cast On (tutorial video here) that is the basis for a Garter Tab Shawl Beginning (tutorial video here). While the start for this shawl is slightly different from the video, it can still help you get an idea of how to pick up the stitches. worth counting the sts between your markers to make sure they’re consistent as you work the WS rows. 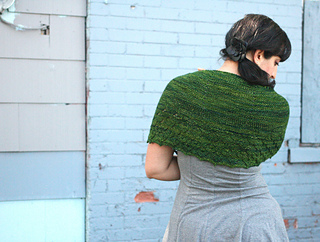 In this shawl you will need to work yarnovers in a variety of situations. Use the chart included in the pattern for what to do in each situation. Yf is to bring your yarn to the front between the needles.